A4 Size 7.3 x 9.8 in. (186 x 250 mm) 8.3 x 11.7 in. A4 Mounted 7.3 x 9.8 in. (186 x 250 mm) 11 x 14 in. A3 Size 10 x 14.4 in. (272 x 365 mm) 11.7 x 15.7 in. THANGKA 14.75 x 19.8 in. (375 x 503 mm) 14.75 x 19.8 in. 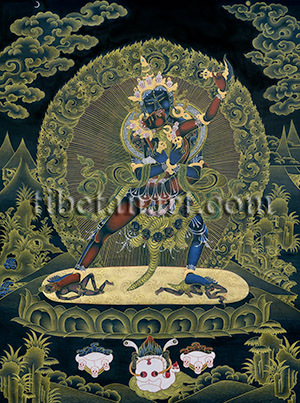 NOTE: The original unbrocaded thangka of this gold-on-black composition by Pema Dorje is for sale, although I have improved the background in Photoshop for the Giclee Prints. Priced at GBP £520.00.